Since I wanted to be an architect, majoring in Art & Art History seemed like a logical choice. Darkroom classes, learning to make pinhole cameras, sketching, drawing, a bit of painting, history of the Renaissance and Impressionist painters… history of pop art and architecture... it was my world for those years. I went on to earn an architectural degree, and practiced in the field of architecture for the better part of a decade, designing, building models, learning to render in AutoCAD… before I found my second (first) home in the art of photography (via architectural photography). 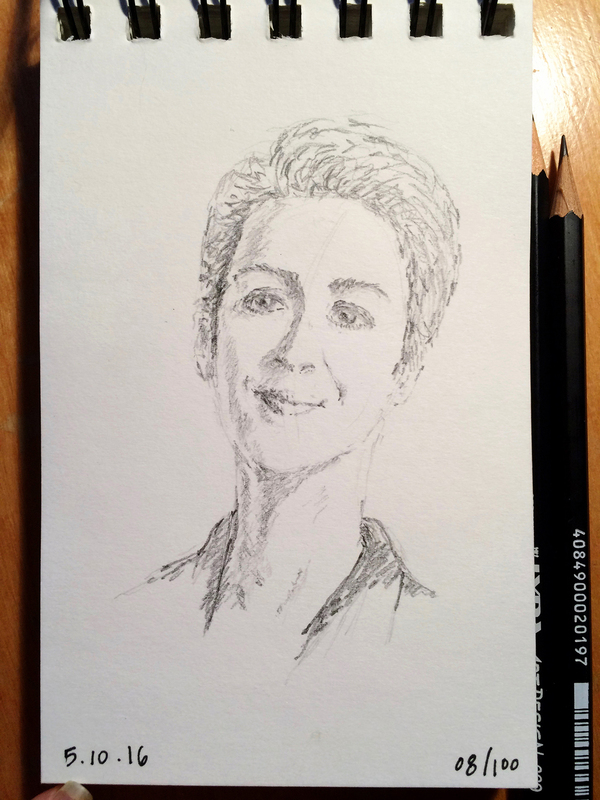 A recent re-ignition of my love of sketching has me thinking quite a bit about how a background in the Arts has impacted everything from my career as a photographer… to how I see the world around me. I was enormously happy to hear on NPR just a few days ago that the prioritization of THE ARTS in education is making a comeback! Impressionist inspired oil painting, Union Square Farmer's Market, Manhattan from my architectural thesis. Architectural sketch of one of my last projects as an architectural designer, a mixed use urban/residential project in Ridgway Colorado. It all started when, just over 2 weeks ago, I joined a group of people who committed to doing a project - something - ANYTHING - for 10 minutes a day, for 100 days. Completely intrigued by the concept, I weighed this commitment and thought about what I'd do with those 10 minutes a day for that long. But, where I used to sketch nearly daily in college and in architecture school, my entire world for the past 2 decades (!) has been fingers on a keyboard, touchpad or camera… eyes on a monitor. As a result, I’ve become totally, completely, 100% intimidated by putting a mark -- ANY MARK -- in any of those sketchbooks. Those beautiful, calling-to-me, waiting to be filled up sketchbooks! This 100 Days of 10 project sounded like the perfect excuse to grab one of those sketchbooks and just START. No more excuses, no attachment to whatever my hands would or would not do any more... just draw. Marks on paper. Every day. For at least a few minutes. I could do at least that, right? So I bravely grabbed the ABSOLUTE TINIEST sketchbook in the house (haha -- not as brave as you'd think, but way more challenging than I thought!)... all the while telling myself I chose this one because it was exactly 100 pages (yeah, ok, it was totally because it was tiny)... and from the first line on the first piece of paper, I was hooked. I mean, I went to sleep, and woke up thinking about it kind of hooked. What I’m LEARNING from this project, especially as I attempt to move from architectural sketches (which come more easily to me) into the push-way-out-of-the-comfort-zone area of portrait sketches, is how much my arts background really has had a significant impact on how I see. I am finding an all new gratitude for the things from my education in the arts that sunk in without me even realizing…. things that have shaped who I am as a photographer… how I see the world around me as an artist and appreciator of this incredible planet. And I'm already FEELING how it is improving my photography to be pushing through creative project like this. I'm SO EXCITED and GRATEFUL. Grateful for my roots in the arts, grateful for the fact that my fingers still know how to hold a pencil, and grateful for having found the tiniest nudge to push me to pick that sketchbook back up again. Oh, sweet and tiny sketchbook... where will you take me next? By the way... if you happen to wish to follow along, I've been posting them daily on my TUMBLR account. I don't really know what I'm doing on Tumblr, so please come say hello -- I'd love to follow you, too! Just ten minutes a day (or more) for 100 days. It’s a fascinating concept FULL of creative growth potential… What would YOU do with that time?